My husband and I recently took an Alaskan cruise. 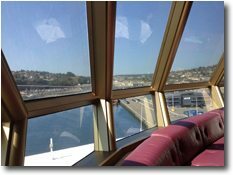 As we settled ourselves for sailaway in front of large windows on one of the highest decks, I heard a little girl ask, “Did we start moving yet? How will we know when we’re moving?” I don’t know what her mother said, but I do know the answer: you fix your gaze on what isn’t moving. I was looking at the building in this picture I took; when the ship starting pushing away from the pier, I knew we were moving because of our view through the window in relation to the stationary building. It can feel like the world is wobbling on its axis. Even our own little worlds. It is crucial to keep our eyes on the One who says, “I the Lord do not change” (Malachi 3:6), on the One who promises, “I will never leave you or forsake you” (Joshua 1:5). We need to stay focused on the unchanging Word of God, in which He reveals that He knows how the future will unfold, and has everything under control-even the end-times horrors that appear to be right around the corner. Later on our cruise, as we were sailing from one port to another, I knew we were moving-apart from feeling it-because I could see the churned-up wake next to the ship. But in order to tell how much we were rolling from side to side, I focused on the horizon which appeared to rise and fall. But since I knew it was unmovable, that meant the rising and falling was happening on the ship. I sat looking out the window, gazing at the horizon that reminded me of God’s unchangeableness. A good and loving God is always, always in control. I am so glad. This blog post originally appeared at blogs.bible.org/engage/sue_bohlin/focus_on_whats_fixed on August 12, 2014.